A real active and adventurous excursion with your group, family or company colleagues starts at the Fun Forest Almere, of course. Move with your entire group for 3 hours through various climbing courses there, through the entire forest. Or would you rather have a forest adventure with your group apart from climbing? You got the choice between three different games then. Each of these stimulates a team feeling – and of course it is about winning, too! Such an active morning or afternoon obviously should be concluded with a great lunch, diner or aperitif. This can be provided by the restaurants Dubbel-Op and Buitengewoon Lekker. 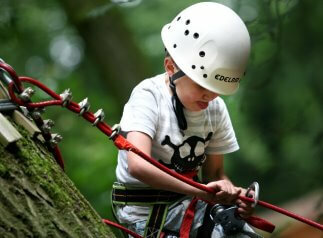 Check all your options and book now your active excursion via the Fun Forest website! 3 hours of climbing through various courses of the climbing forest. For climbing the courses you got to be at least 18 years old and your body height should be at least 1.30m. 2 hours of activity, playing various games. You can choose between these games: Under Construction, Forest Games or Master Minds. Minimum group size is 8 participants, minimum age is 18 years. Has your group more than 20 persons? Then you’ll get a 10% reduction on the regular entrance fee. Also, the climbing park can then be opened for your group outside the regular opening hours.